Coloring pages, pictures, wallpapers and fun with Winnie the Pooh and friends. Do you know from which book this quote is? Do you know from which book/movie this quote is? Isn’t Spring a lovely season? I know Roo will certainly agree with me. Have you seen Springtime with Roo? I would love to know what you think of this movie. You can find here lots of pictures and more information about this lovely movie from Roo. Are you looking for a great toy set which you can easily bring along on your holiday? Look at this lovely Winnie the Pooh playset! 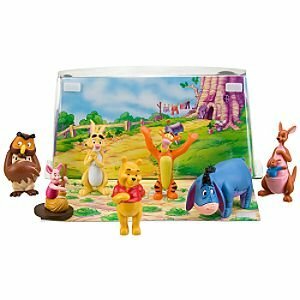 Set includes Winnie the Pooh, Tigger, Piglet, Eeyore, Rabbit, Owl and Kanga with Roo toy figures. Scenic display packaging with 100 Acre Wood backdrop. Back of package folds down to form a Rabbit’s House and garden setting. To finish this day I’ve also added 171 coloring pages. Enough to choose from so all children will find the coloring page of their choice. Love the 946 new pictures from Winnie the Pooh? Than you will certainly love the 376 wallpapers. You can choose from different sizes, characters and themes. Enough choice for everyone! Do you like Winnie the Pooh as much as I do? Than you will love the 946 pictures I’ve added to the gallery. Check out all the pictures of Winnie the Pooh, Piglet, Tigger, the movies, Christmas, Birthday and lots of other themes and characters. Pooh is getting together with all of your favorites from the Hundred Acre Wood in the new Winnie the Pooh movie, out in 2011! Take a look at the new trailer for the film below. Winnie the Pooh – Boo To You Too! Poohfriends.com is part of the Disneyfriends.net Network. This is a network with lots of Disney related websites. The following characters/movies have a website of their own. This site is part of Judiths Disneyfriends Network and is hosted by Webbed. The pictures, characters, and their names are the Copyright � of Disney.